Having been bested by the pigs he was raising in The Great Pig Escape, Bert shows he is still holding a grudge against a certain segment of the porcine set in The Great Pig Search. When Bert and his wife Ethel receive a postcard from Florida reading, “OINK!” Bert insists on heading to Florida to look for the pigs (a trip he pitches to Ethel as a vacation). When the couple arrives in Florida, it is clear to sharp-eyed readers (and picture viewers) that the pigs are hiding in plain sight. Disguised, they are Bert and Ethel’s taxi drivers, motel clerks, tour operators and evening entertainment. 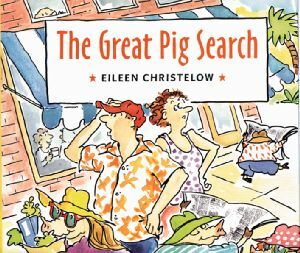 When the pigs feel that Bert is getting too close for comfort, they send the couple off on a wild pig chase through the wildlands of Florida. The climax of the book comes at the end of a fishing trip as one of disguised pigs saves Bert from being pulled into the sea by a large fish. The media greet them upon their return to land and it is clear in the newspaper’s picture that it was a pig who saved Bert. I really appreciated the silliness of the story in that that the pigs continue to one up Bert (who refers to the pigs in the beginning as pork chops). However, I didn’t like that the fish didn’t get the same chance to outwit Bert. This plot twist made the book hard to enjoy, and was disappointing. It could be challenging for the adult reader to explain to children why the author decided pigs were worthy of creating an escape story but fish were not. This book is for ages 5 and up.